This Is What Happens When A Python Meets An Alligator In The Everglades | Deveoh! 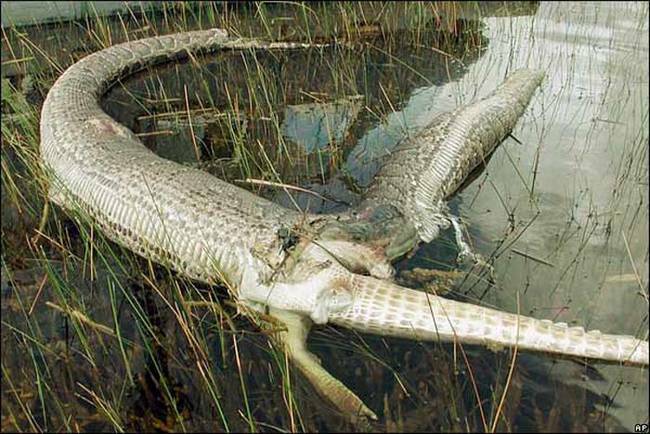 Pictured below are the remains of a 13-foot python that attempted to eat a 6-foot long alligator. As you can tell from the picture, it didn't end well for the python (or the alligator). Its torso burst after consuming about half of the gator. Park rangers speculate that the gator might have clawed out the snake's insides as it was being eaten.